Stewart B. "Stew" Shacklette began his calling career in 1947 while still in high school. When he graduated, he attended two years at Western Kentucky State Teachers College (before it became a Western Kentucky University in 1966). He enlisted in the U.S. Navy in 1949 and was stationed in San Diego, California. 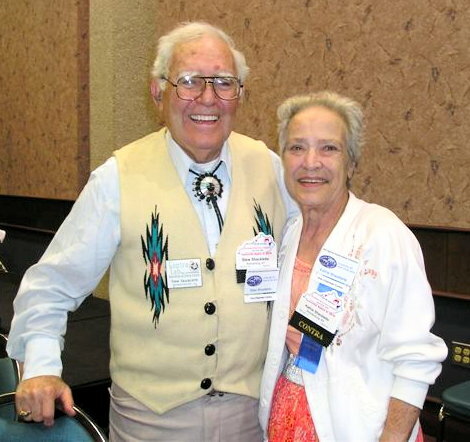 While in San Diego, he became involved in the square dance movement and joined the Southern California Callers Association, the Northern California Callers Association, and the San Diego Callers Association (where he served one term as President). He met two square dance callers, Harold Lindsey and Bob Shepherd, in San Diego at the YMCA who helped him with his square dance calling. After Bob passed away, the YMCA hired him to call on alternate Monday nights. Then Harold passed away, and the YMCA asked Stew to cover all four Monday nights. At that time, Stew and some USO-type girls formed a YMCA club called the Y's Allemanders and danced every other Thursday. Before long he was calling seven nights a week. The hardest thing to do when he first started was to find resources. It was 1949 when Bob Osgood started Sets in Order and he was able to get these magazines and was featured one year. After Stew was discharged from the service in 1952, he moved to Louisville, Kentucky where he co-founded the Louisville Callers Association. Also around that time he met Shirley Durham who taught folk dancing and had a great influence on him. Folk dancing was strange to him but the love he had for dances inspired him to learn them. Stew completed his college degree at the University of Louisville, where he graduated in 1961. Stew then moved to California where he taught physical education and social studies for a private school for a year and also drove a school bus. Returning again to Kentucky, Stew taught in the public schools, and called for seven different square dance clubs. In 1960, Shirley Durham (who became Shirley Fort after she married) was one of the Kentucky Dance Institute's directors and she insisted that he come to KDI. He enjoyed it so much that the next year she put him on staff and he's been there ever since. In the beginning Rickey Holden, who was a square dance caller at the time, was on staff. Rickey was also doing some dance research in Europe for Frank Kaltman. That introduced Stew to square dancing and folk dancing together. Stew became a permanent staff member and then a director of KDI. He served six years as president. Bob Osgood was most influential in Stew's calling. In folk dancing his mentor was Shirley Durham Fort. When Stew was calling squares in 1955 in San Diego, he met Doc Graham, a friend of Bob Osgood, who was calling contras. Doc helped Stew by taping his contra prompting and critiquing the tapes. In 1975, stew became a member of Callerlab. He served on the Board of Governors for four years, as Chairman of the Contra and Traditional Committee for seven years, and Chairman of the Board for two years. Stew is a member of the National Teachers Association of Line and Country Western, the Lloyd Shaw Foundation, and the National Folk Dance Society. In 1991 Stew, along with David Lewis, founded the Kentucky Dance Foundation with the goals of preserving square and folk dance music and dances for the future. The foundation acquired the Folk Dancer label and inventory from the estate of Michael Herman. After acquiring the inventory and copyrights and a building to store them, Stew and his wife Kathie sorted and shelved 71,000 pounds of phonograph records. Stew and Kathie worked over two and a half years digitally recording this music and converting the records to compact disk. The upper floor of the building houses Stew's recording studio, his office, and his miscellaneous archives of over three thousand American traditional dance publications. The lower floor houses old breakable 78-, 45-, and 33-1/3-inch records, even some ancient bakelite-like disks a quarter-inch thick with grooves on one side only. Stew wants to make this treasure of historical tunes available to dancers everywhere. In 2003, Stew received the National Dance Award from San Antonio College for this work. In 2004, Callerlab gave Stew their highest honor, the Milestone Award. Stew has taught at the Florida Folk Dance Camp, Kentucky Dance Institute, Mainewoods Dance Camp, and York Contra Dance Weekend to name a few. Stew put out some feelers for a successor, and a young man and his wife from Georgia came up to visit and talk it over. The couple were interested enough that they sold their house in Georgia, moved to Versailles, Kentucky, and he got a state job in Frankfort. He and his wife will eventually come in and continue what Stew and Kathie are doing and have formally agreed to take over after Stew and Kathie have passed on. Stew is now retired but is still active in caring for the Folk Dancer records. He can mix down onto a CD any combination of tunes from a record or any combination of different records. One CD will hold up to thirty short tunes or fewer longer tunes  up to about seventy-nine minutes. He can even slow down the recording, at pitch, so it’s useful for handicapped dancers. Stew charges $20.00 to mix down a CD and the shipping costs are $3.00 to anywhere in the U.S. Vinyl record prices are $2.00 for 78s, $12.00 for LPs, $5.00 for 45s, and $7.50 for 45 rpm extended play. He has reproduction and resale rights over the entire Michael Herman collection, and most of the others, too. The Folk Dancer record collection is listed on a DVD. Stew received the National Folk Organization's "Preserving Our Heritage" award in 2014. Contra Calling Made Easy: Workbook on basics of contra dancing; by Stew Shacklette; 1980. Nine Week Square Dance Training Program: For grades 4 thru 7; by Stew Shacklette, 1981. Contra Prompting Handbook: Suggested programs for square dance callers; by Stew Shacklette, 1982. Stew's Folly: 186 contras and other things; by Stew Shacklette, 1998. Dances Stew has taught include A Little Bit Longer, A Little Bit More, A Little Bit of Sunshine, A Little Too Late, A Penny Earned, A Penny Saved, All the Way Home, All the Way to Louisville, Almost the Same, Anna's Dance, Another Dizzy Double Duple, Another Shade of Green, Another Way Same Thing, Anytime, At the Meeting, Back to Back, Big Dipper, Brandenburg Bridge, Brandenburg Double Duple, Break Time, Can't Wait, Casting Stars, Circle Do, Coffee Time, Country Life, Cross the Girls, Crossing Six, Dad's Day Dance, Dancing on the Levee, Dark Blue, Dark Green, Dillie Dillie, Dizzy Double Circle, Doe Run, Doe Valley, Dog Days of Summer, Dog Gone, Double Duple, Down and Out, Dutch Treat, Early Morning, Easy One, Extractin, Family Revisited, Fast Run, Fasten Your Seat Belts, First Day of May, Fun Time in Kentucky, Grand Square, Good Luck, Great Expectation, Green River Trio, Here It Is, Here We Are Again, Here We Go Again, Home at Last, Honeymoon Polka, Hot Humid and Hazy, Hurry Up and Wait, I Like Blue, I Think I Can, Island in the Sun, It's a Date, It's OK, J.D. (Just Dog), Jail Bird, Jean's Fling, Jerry's Idea, Jump Up, Just Another Contra, Just as Good, Just for Fun, Just for Robin, Just in Time, Just Rain, Just You and Me, Kathie's Delight, Kentucky Running Set, Knoby Knight, Laddie, Last Chance, Last Time, Late Arrival, Lavender Blue, Lazy Lake Let's Dance, Let's Go Again, Light Blue, Light Green, Limited Action, Little Dipper, Lone Pines, Long Branch Reel Long Drive, Long Lines, Long Needle Pine, Long Needle Reel, Lost Change, Lots of Help, Lots of Hope, Lots of Luck, Lots of Wind, Lowdown Hoedown, Lucky Seven, Lucky Waltz Contra, Meade County Fair, Meade County Reel, Melanie's Tree, Military Schottische, Mona's Trip, My Mickey, My One and Only, New Years Eve 1997, Now is the Time, OK Start, Ole Buck, Old Buck Ain't Here No More, Olympic Torch, On the Way Home, On Time, One by Two, One More Time, One Step Back, Only Six, Pine Point, Polka Dot, Push and Pull, Radcliff, Radio Tradio, Retired, River Rat Ramble, Room at the Top, Rough Flight, S.A.C., Sample, Saturday Morning, Second Chance, Second Time, Short Break, Short Drive, Short Week End, Simone's Waltz, Simple Simon, Slow Run, Some Do, Some Don't, Some Will, Some Won't, Something Blue, Something Borrowed, Something New, Something Old, Spring of Eighty Four, Star Wood, Stop Short, Sugar Shack, Sunday Morning, Sweetheart Starter, Ten Dollar Boat, The Baker's Wife, The Barn Mixer, The Barn, The Last of the Beeches, The Lighthouse, The Little Colonel, The Milky Way, The Other Shade of Green, The Other Way, The Rear Guard, There it Was, Thirty-Five Years of Waiting, Three for Free, Tom's Pond, Tornado, Traffic School, Triple "D," Troy's Trip, Two Peanuts, Two Steps Forward, Two-Step Trio, Wee Willie, Wind and Rain, Worth a Dime, and You Are the One.